It's easy to be fooled into thinking that moments in this episode are comedic, clever or inspirational. It certainly covers a surprising amount of territory, from the kidnapped quintet landing in Beanstalk Village, the flashback that attempts to offer redemption to Katsuharu and company, soliciting a train and taking it on a rough ride to an intense standoff with the Royal Knights. There's enough going on that we can't accuse it of being a filler episode, but it falls apart under any degree of scrutiny. Closer examination reveals several lazy, rehashed moments, a whitewashing of the fact that the bad guys win, and Katsuharu and company are still pretty much assholes. We'll start with the positive- the notion that these four new kids are revisiting a previous off-screen adventure is really neat. 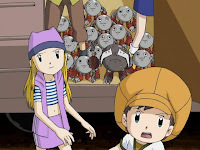 Retracing prior steps happened frequently in Adventure and the main crew will do a bit of it in future episodes. To do it with kids we haven't seen before adds a bit of depth and realism to their experience, making it easier to buy that they really were roaming around the Digital World for this long. The flashback even sounds exactly like the kind of trite, dull episode we'd get early in season one. 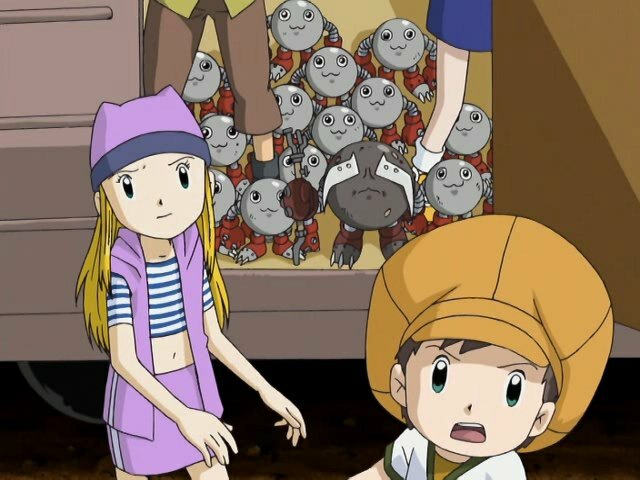 Of course, despite trying to prop these kids up by demonstrating that they've had their own proper journeys, they really did little more than leech off the impoverished Mamemon. The Mamemon were saints for welcoming them in and sharing their rations, and they're rewarded accordingly, but it doesn't paint the kids in any better light. It doesn't make much sense for the Royal Knights to capture the new kids, as it draws the only force that has a chance of matching them into a battle that really didn't need to be fought. With the Mamemon locked up, it's hard to believe the duo wouldn't have found the key to converting the area's data eventually. It was glowing at the top of the beanstalk; did they really need to kidnap the entire village and five outsiders to figure out where it was? The rescue mission is amusing only as much as you still enjoy the Trailmon. I love those guys, and seeing some old favorites like Franken and under-utilized trains like Franken and Raccoon Dog was fun. Even then, it's disappointing that the journey to the village was marred by going back to the well. The kids bribe Worm the same way they tried to bribe Angler previously, resorting to old tactics like cleaning, chocolate, and Zoe slutting it up. The kooky, physics-defying train tracks has also been done before. The only clever bit was the kids using already covered track to not only fix a bridge, but force Worm to cross it. 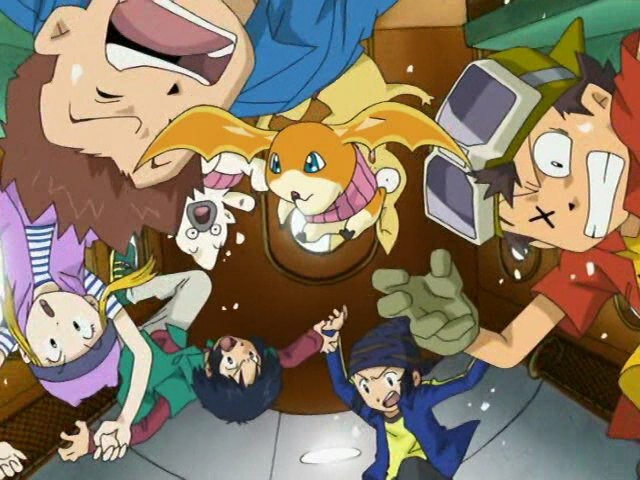 Once the negotiations break down and the fighting begins, we end up in a scenario that's going to be repeated endlessly throughout the next few episodes: in spite of EmperorGreymon and MagnaGarurumon's best efforts, the data is scanned and that part of the world is destroyed. Even now, in our first time, it's a problem. The rescue ultimately has to go down as a terrible mess. The Royal Knights totally dominated the battle, Koichi let himself get into danger, the Mamemon are left without a home and Lucemon is one step closer to revival. 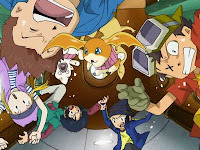 In spite of this, both the digidestined and these new kids part on happy terms, smiling happily as they wave goodbye. Bad as it is that Takuya and Koji are the only characters who mean anything and in the same battle waged ad nauseum, what really kills this arc is the attitude of consolation. “Well, the Royal Knights weren't beaten, but these kids are heading home safely and the Mamemon all survived.” That's not how it works. The Royal Knights got exactly what they wanted, the new kids contributed nothing and the poor Mamemon are now homeless. They don't get a gold star for that. Wow, JP is extra pervy today, jockeying himself to get into a compromising position with Zoe twice! Number of times Zoe punishes him for such transgressions? You know the rule- only when she thinks she's being sexually harassed, never when she actually is. Other than a frustrated look, she shrugs off both encounters. 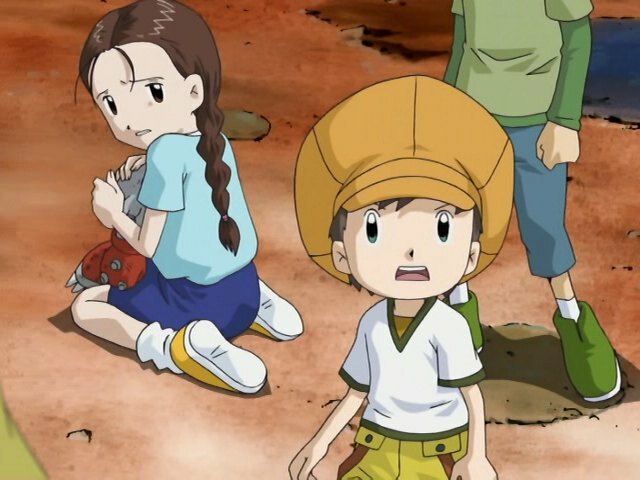 Worm's comments about the destruction of the Digital World are a good perspective of what most Digimon probably feel about the whole thing. He seems rather resigned to the fate, just as Baromon was. When it's the Royal Knights doing all this, it does feel like a “paving paradise to put up a parking lot” situation, where the locals are more likely to sit around disappointed singing Joni Mitchell songs than actually be angry about what's going on. By my count, this is the third time a Trailmon has done the physically impossible task of ramping a the train track. Bonus difficulty- the kids installed the ramp... or at least the boys did. Zoe just kinda stood there and watched. Of all the “they're not just data!” speeches in the franchise, Katsuharu's to Crusadermon's is easily the most regrettable. He hasn't earned the right to declare that and for her to argue against it is horribly elitist. MagnaGarurumon rescuing Koichi was creepy enough without Crusadermon gushing over the awkward twincest moment. How can the dub censor Crusadermon's original concept but not stuff like that? The worst thing about the Awkward Twincest Moment is that I can't even tell if that's how it played out or if that's how it looks after an application of in-universe shipping goggles on the part of the pink-faced creep. In all honesty, I don't know which one's worse.